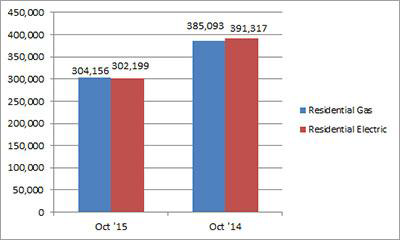 U.S. shipments of residential gas storage water heaters for October 2015 decreased 21.0 percent to 304,156 units, down from 385,093 units shipped in October 2014. Residential electric storage water heater shipments decreased 22.8 percent in October 2015 to 302,199 units, down from 391,317 units shipped in October 2014. For the year-to-date, U.S. shipments of residential gas storage water heaters increased 0.8 percent to 3,692,890, compared to 3,664,101 units shipped during the same period in 2014. 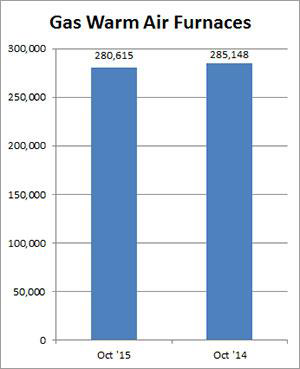 Residential electric storage water heater shipments decreased 2.7 percent year-to-date to 3,426,495 units, compared to 3,521,976 units shipped during the same period in 2014. 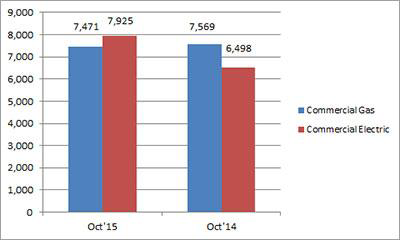 Commercial gas storage water heater shipments decreased 1.3 percent in October 2015 to 7,471 units, down from 7,569 units shipped in October 2014. Commercial electric storage water heater shipments increased 22.0 percent in October 2015 to 7,925 units, up from 6,498 units shipped in October 2014. Year-to-date U.S. shipments of commercial gas storage water heaters increased 3.4 percent to 81,633 units, compared with 78,944 units shipped during the same period in 2014. Year-to-date commercial electric storage water heater shipments increased 16.9 percent to 72,438 units, up from 61,976 units shipped during the same period in 2014. 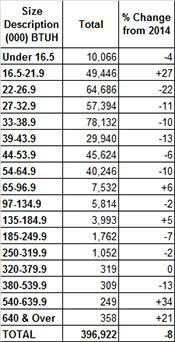 U.S. shipments of gas warm air furnaces for October 2015 decreased 1.6 percent to 280,615 units, down from 285,148 units shipped in October 2014. 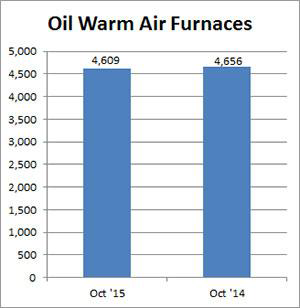 Oil warm air furnace shipments decreased 1.0 percent to 4,609 units in October 2015, down from 4,656 units shipped in October 2014. Year-to-date U.S. shipments of gas warm air furnaces increased 4.9 percent to 2,310,614 units, compared with 2,203,327 units shipped during the same period in 2014. Year-to-date U.S. shipments of oil warm air furnaces increased 7.8 percent to 28,605, compared with 26,535 units shipped during the same period in 2014. 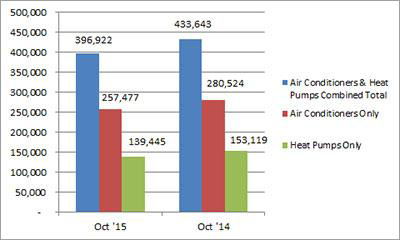 U.S. shipments of central air conditioners and air-source heat pumps totaled 396,922 units in October 2015, down 8.5 percent from 433,643 units shipped in October 2014. 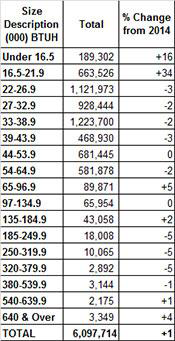 U.S. shipments of air conditioners decreased 8.2 percent to 257,477 units, down from 280,524 units shipped in October 2014. U.S. shipments of air-source heat pumps decreased 8.9 percent to 139,445 units, down from 153,119 units shipped in October 2014. Year-to-date combined shipments of central air conditioners and air-source heat pumps increased 1.1 percent, to 6,097,714 units, up from 6,033,336 units shipped in October 2014. Year-to-date shipments of central air conditioners increased 2.2 percent to 4,082,457 units, up from 3,993,768 units shipped during the same period in 2014. The year-to-date total for heat pump shipments decreased 1.2 percent to 2,015,257 units, down from 2,039,568 units shipped during the same period in 2014.